recently got my hands on a GoPro Hero video camera. I honestly never gave GoPro much thought since I am in the media business and use a lot of high end video gear all the time. Underwater, I’ve been shooting with a slightly outdated Sony HD camera in a Light & Motion housing and a pair of mounted video lights for a long time. It’s compact for what it is, but I set a goal recently to be able to travel without carrying any of that, including my MacBook, and just shoot and edit with a little camera and an iPad. Even with the other camera, the GoPro has made quite a mark as a cheap and virtually indestructible POV cam. After purchasing the GoPro, I did a little research and learned that the Hero 2 shoots blurry video underwater because of some kind issue with the dome port on the standard housing. Fortunately, the solution is a $40 replacement housing from GoPro that has a flat port instead of the dome. So far, I haven’t shot anything underwater with either of them, so the only comparisons I have are from YouTube, but that’s not the point of this post anyway. I have been struggling for a while over how I could mount the camera without interfering with my mask or other equipment. 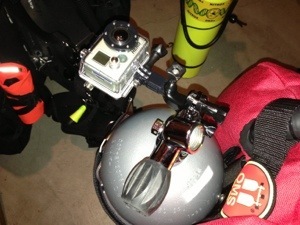 I want to shoot hands-free, and be able to create time lapse sequences of entire dives. So, here’s what I came up with. 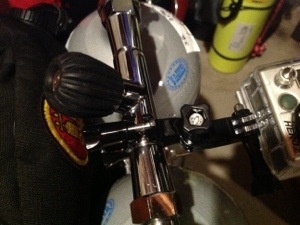 Using the GoPro’s handlebar mount, I’m able to attach the camera directly to the valve of my old school 3500 psi Genesis 100 scuba tank. This is actually a second generation valve. Unlike the original, it is configured to attach an H-valve or isolator bar, and the extension provides the perfect attachment point to mount the GoPro. And, I can reach it, so I can turn it on at the beginning of the dive and not have to shoot a bunch of video of the sky prior to descending. That’s the theory anyway. Doubles are a little different setup. Well, actually it’s the same setup, but a different concern. For technical dives, I love the idea of shooting the entire dive from the diver’s perspective. I’m not sure if it’ll be all that cool shooting dives with the back of my head always in the frame, but that’s something I’ll deal with later. Mounting the GoPro to my doubles isolator bar works just fine, and I can reach it. However, the thumbscrews could potentially impede my ability to control the isolator valve, which is not something I’m willing to risk on a ceiling dive. I’ll try it in shallow water and see if its a problem. My guess, just by looking at it, is yes. Plan B will be to replace the thumbscrews with stainless hex head screws cut to exactly the right size. That will get the GoPro mount completely clear of the isolator knob. I could also use a remote isolator knob, but that means more crap on my chest, and I’m not accustomed to that setup anyway. The pictures aren’t great but you get the idea. 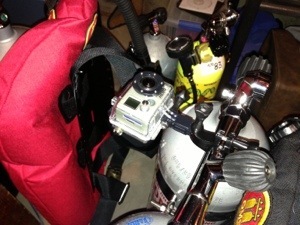 In a week or so, I’ll get underwater finally to see how it all works out. In the mean time, if you have experience with this arrangement or something similar, I’d like to know how it’s working. This entry was posted in Dive Travel, New Dive Gear, Technical Diving and tagged backplate, dive travel, diving equipment, harness, oms, scuba cylinder, technical diving, underwater video. I use a GoPole as standard as very controllable once you get the hang of it, you can put it in holes etc and geting very close to the subject without freeking it as a bonus you have the length of the pole between you and said subject. I am looking to mount a second GoPro somewhere so I have a second point of view and on my tank is as good a place as any so the tips were very useful many thanks. I’d use a pole first for control of exactly what you want to shoot, then add extra static “run and forget” cameras for extra view points, as for value the Hero 4 should be out in October 2014 and it will run 1080P @ 120fps and 4K @ 30fps and for around £350 there is nothing else on the market at that price that gets even close to those specs. This was all shot on a GoPro Hero 3 May 2014 part with and part without a red filter to test the difference, my advice just use a red filter it makes a huge difference to the end result. 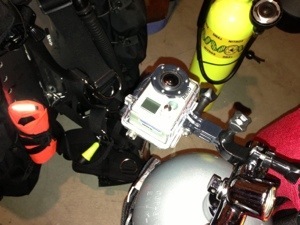 I would like you try out our new (patented) scuba mount for your Go Pro camera. Perhaps you can comment on it on your site. We having are good success with it here in our local shops some our shops in southern Cal. Its an over the shoulder hands free mount, that is easily within reach to adjust angles or, turn on or off. It also comes with a leash for peace of mind. Just send us your adress and we can send you some our other product same samples as well. (patented pole spear leash and head strap leash for the Go Pro camera.) The over the shoulder mount can be position over either shoulder. Here is a recent video sent to us by a customer who was diving in Cancun.